It is downright unfair to pick a couple of poems from a prolific poet to represent them. In each of my entries during my observation of Poetry Month, I pick one or two poems (or a few more in the case of Langston Hughes). 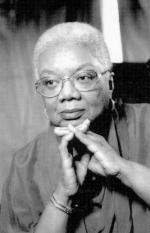 I cannot find my tattered paperback copies of two volumes by the late poet Lucille Clifton. I read them so much they are held together with elastic and I know I put them somewhere for safe-keeping and that included safe from me. I was able to find two of her poems on line that I especially like, “listen children” with its celebratory poem and “the loss baby poem” a prayer, promise and admonition. Grolier Poetry Book Shop founded in 1927 and owned by poet and Wellesley College Professor, Ifeanyi Menkiti.